WB No. 242: STELLA MARIS sleeping quarters include a master stateroom forward with an “island” double berth. Aft of this, tucked beneath the wheelhouse, is a stateroom featuring two stacked berths to starboard, and a head to port. The head is cleverly located under the pilothouse berth. STELLA will cruise efficiently at about 8 knots, burning just 3 gallons per hour at that speed. Considerable additional horsepower will push her to 10 knots, and she’ll require 11 gallons per hour to do that. STELLA’s hull, say the designers, is a compromise between performance, looks, and interior volume. She’s more streamlined than a working shrimper, with a finer entrance and less immersed volume aft. 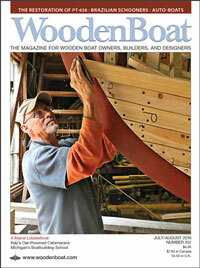 See more in Designs: Sketchbook, WoodenBoat issue 242.